Angelique is Stunning!! 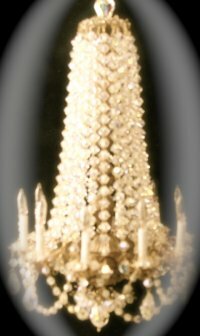 It is much like the Lady Jo, but this is slightly longer and has more Crystals. 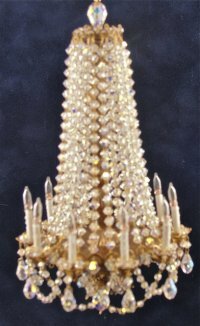 Each bobeche is adorned with a briolette tear drop. The frame is "antiqued Bronze" as opposed to shiny gold which is also beautiful. The Swarovski crystals are Aurora Borealis and my camera doesn't capture the sparkle. 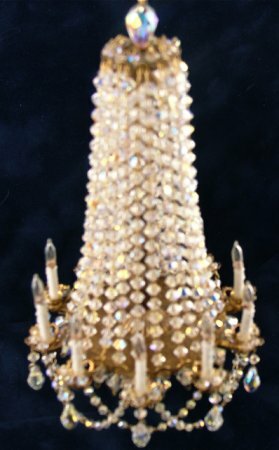 The Crystals on all of my chandeliers are NOT THREADED ON METAL WIRE. They have movement just like their life size counterparts.